So far Group D has provided the most drama in the U18 European Championship for Women Division B. With one day to go three teams are still in the battle for one place. In Group A the qualification will also go down to the wire on the last day of the First Round action with the winner that is either Estonia or Poland advancing to the Quarter-Final Round. Lithuania completed their First Round dominance of Group A with a victory over Israel (79-55). Lithuania who have not trailed in any match so far put the contest to bed by the end of the first quarter leading (25-3). 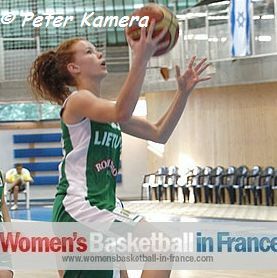 Dalia Belickaite (in picture below) with 16 points and 7 steals was the leading player for Lithuania while Roberta Mizgeryte and Daugile Sarauskaite dominated the rebounds with 10 and 11 each. Lithuania have now two days off before they start the quest for promotion. Israel on the other hand are eliminated and must prepare for another season of European Championship basketball in Division B.
Poland made light work of Norway (70-31) in the other game from the group. In Group D, Germany beat Austria (58-50) with 21 points and only 9 rebounds coming from Noémie Rouault. Germany have now completed their first round and must sit and watch the match between Austria and Bosnia and Herzegovina to know their fate. A victory for Austria will eliminate Bosnia and Herzegovina. If the margin is less than 12 points then Germany advance, otherwise Austria advance. Belgium claimed first place in the Group with a match to spare by ending the unbeaten run of Bosnia and Herzegovina (63-40). Belgium led from the start and had a double-digit lead with less than eight minutes played (15-2). Bosnia and Herzegovina's poor shooting from the floor with 17-from-61 did not help their cause. For Belgium it was the turn of Celine Lemmens to lead the team in scoring with 10 points.